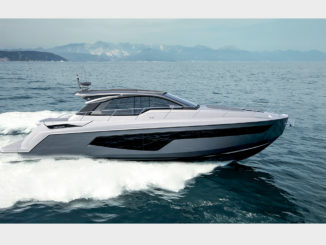 Sea Ray will debut the all-new Sundancer 520 during February’s Miami Yacht Show. This new yacht is designed for maximum flow of natural light, creating a seamless yachting experience and maximum onboard enjoyment. 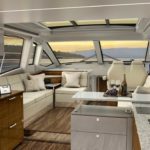 The Sundancer 520 features sophisticated new styling, ample windows and contemporary materials, which all contribute to the bright, sunlit aesthetic. Interior features offer new wood selections, which are expertly crafted and grain-matched throughout to elevate the overall visual appeal. 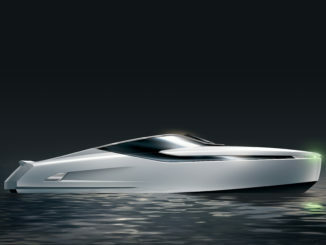 The entirety of the yacht is geared toward effortless entertaining and luxurious livability. 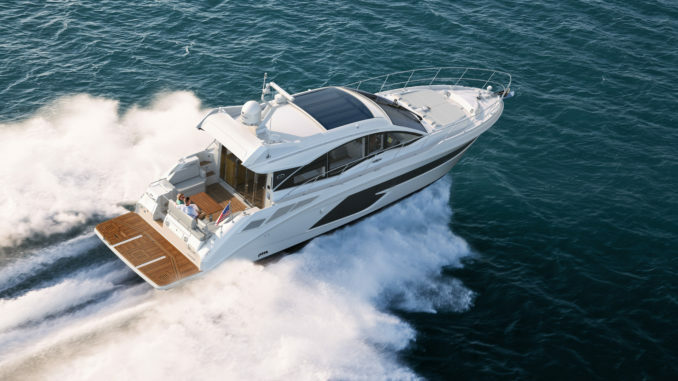 Innovative design is apparent in the cockpit, where Sea Ray’s ingenious seating solution creates maximum versatility. The aft lounge seat, with convertible backrest, slides forward and aft to form multiple configurations, facing into the cockpit from the aft position or brought forward to overlook the swim platform. An optional transom gourmet station adds a grill and large storage drawer, further enhancing sociability. A large lazarette can be accessed from the swim platform, making it easy to stow water toys and gear. At night, upgraded lighting designs create a compelling environment. Inside, the main level salon is accessible from the cockpit through a wide, stainless steel framed door. 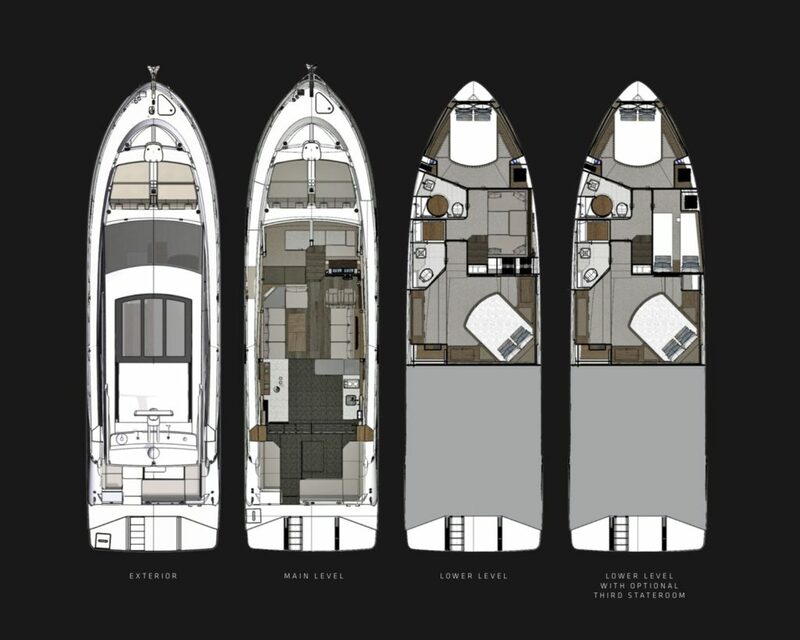 The salon’s convenient galley aft layout provides a hub for both inside and outside entertaining. Premium amenities in the galley include stainless steel drawer style refrigerator/freezers, solid surface countertops with sink and faucet, and abundant storage. Forward of the galley, the salon encourages relaxation with plush opposing sofas and a standard 50-inch TV, which rises to provide an exceptional viewing experience. The helm station ensures confident command, with touch sensitive switch panels and a full suite of the latest Raymarine® electronics. Two richly appointed lower level staterooms treat guests and owners alike to luxurious accommodations with abundant storage. 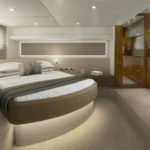 Aft is the full-beam master stateroom, which creates an inviting escape, complete with a private head and entertainment features. Like the salon, this space maintains a great connection with the outdoors thanks to large hull windows. Forward, the guest stateroom includes a queen bed and access to the guest head. A lower seating area is featured starboard with a hull side window, opposed seating and a table. 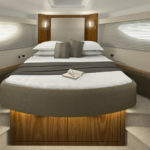 Owners can opt for a third stateroom in this space that features twin bunks and additional storage. The yacht makes full use of exterior spaces as well, including an expansive bow lounging area with room to relax while enjoying music. An optional sun shade can be added. 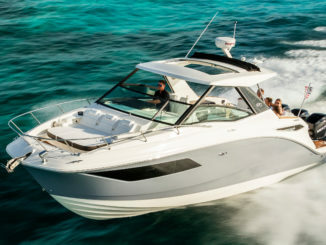 In terms of performance, the Sundancer 520 features Cummins QSC 600 engines coupled to Zeus® pod drives featuring a joystick propulsion control with Skyhook Station keeping and automatic hydraulic trim tabs that enable operating the yacht with ease. To build on a great hull form, an infused hull and advanced lamination structures support the performance needs of modern boaters. 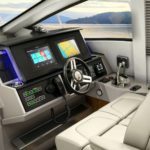 Further enhancing the outstanding ride quality and handling, which Sea Rays are well known for, the Sundancer 520 can be equipped with an optional gyro-stabilization system. 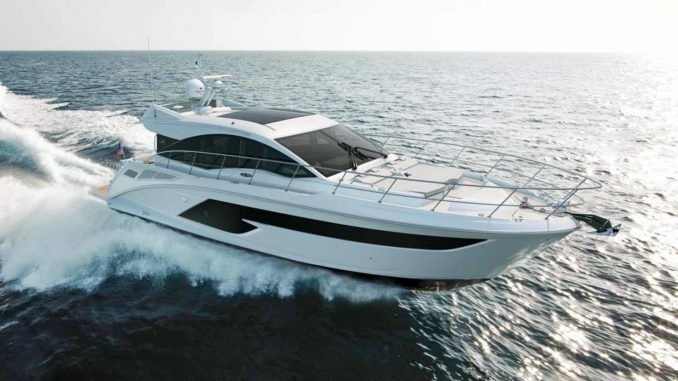 Manufactured in Palm Coast, Florida, at Sea Ray’s state-of-the-art facility, the Sundancer 520 reflects superior craftsmanship and attention to detail. For instance, in the engine room, a white finish, superior routings and plenty of service room make this boat a breeze to maintain. 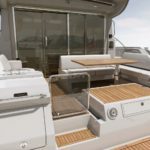 The electrical system features easy-to-access breakers and an innovative touch-sensitive switching system at the helm, making the systems intuitive to use and providing the highest level of durability.